President Trump lamented yesterday that it takes 20 years to get an energy pipeline permit approved but vowed to speed up the process to just 60 days. "We're going to make it easier for you," the president told an enthusiastic crowd of hundreds of heavy equipment union workers after signing two executive orders aiming to help the oil and gas industry. 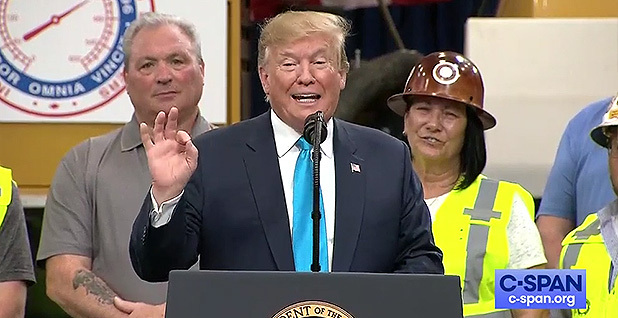 Speaking at a union training facility in Crosby, Texas, Trump signaled his intent to boost production in the United States at a time when the country's energy output has already hit historic highs as a result of the shale oil boom. What started months ago as a White House effort to address pipeline bottlenecks has unfolded to a multiheaded initiative that directs federal agencies from EPA to the Labor Department to review policies on energy development. The pair of orders have been in the works for months and were shaped partly by the American Petroleum Institute, executive director Mike Sommers told E&E News. "I think the role we played was to make sure they understand how big of a problem it was because of statewide efforts to delay pipeline infrastructure from being built," he said. Yesterday, Trump declared his administration has torn down "barriers to production." "We made a lot of progress in the past 2 ½ years," he said, adding, "At the same time, we have to protect the environment. The U.S. has the best air and water in the world." The president signed the orders, the 103rd and 104th of his presidency, between two fundraisers yesterday in Texas that the campaign is expecting to raise $6 million. The first fundraiser was in San Antonio at lunch followed by a later event in Houston. The most significant part of his initiatives are aimed at conflicts with Democratic governors in the Northeast over sections of the Clean Water Act. "Texas is the heart and soul of the energy industry in the U.S.," said Stefan Krantz with Hogan Lovells. "It seems appropriate that for an announcement like this where he is prioritizing energy he would do that in Texas even though the genesis originated elsewhere." Trump blamed "radical activists" for driving up household heating costs fourfold in the Northeast because New York Gov. Andrew Cuomo (D) blocked pipeline construction over water quality concerns. "The two executive orders will fix this dramatically," Trump asserted. But close observers were unclear how these directives would affect the energy sector, much of which is overseen by state officials and, more importantly, driven by energy markets. Members of Congress, meanwhile, celebrated or decried the executive actions along party lines. Senate Environment and Public Works Chairman John Barrasso (R-Wyo. ), who Tuesday reintroduced a bill also aimed at state certifications, applauded the actions saying, "Washington state and East Coast states have used this authority to slow down important energy projects." "I will continue to work with the Trump administration on this critical shared priority," he said. Similarly, Sen. Lisa Murkowski (R-Alaska), chairwoman of the Senate Energy and Natural Resources Committee, lauded the move. "We need fewer delays, greater predictability in our permitting process and better coordination among government stakeholders to ensure needed projects can become reality," she said. House Energy and Commerce Chairman Frank Pallone Jr. (D-N.J.), whose state could be home to the planned controversial PennEast pipeline, vowed "to fight this tooth and nail." "Allowing a president to force through pipeline projects regardless of a state's wishes would prevent both the state and its residents from having their voices heard," he said. "In my home state of New Jersey, there are concerns about these pipelines, and the last thing we want to do is strip away a state's opportunity to have input into the siting of these facilities," Pallone said. The executive orders target states' ability to block Clean Water Act permits. President Trump did not mince words when speaking about who would benefit from the executive actions, specifically mentioning one New York natural gas project. "In New York they are paying tremendous amounts of money more for energy to heat their homes because New York state blocked a permit to build the Constitution [natural gas] pipeline," he said. "And we actually buy a lot of oil from other countries because we aren't being permitted to build a pipeline through New York state. "How about that? Not too good." The executive order directs EPA to review agency guidance and potentially limit the amount of time states have to certify that projects meet state and federal water quality standards. Section 401 of the Clean Water Act gives states a "reasonable timeframe" to make decisions on whether to approve, deny or condition permits. Different federal agencies have set that as meaning anywhere from 60 days to one year after a state deems an application complete. That means some state reviews — including New York's review of the Constitution project — can actually take several years from the time an application is filed as states continue to ask for more information. "You know about delays, where it takes you 20 years to get a permit," Trump asked the audience in Crosby. "Those days are gone. Now, you may not get it at all, but it's going to be quick." The order also directs EPA to consider "the appropriate scope of water quality reviews" and "types of conditions that may be appropriate to include in a certification," language that is likely a direct response to Washington state's blocking a permit for a coal export terminal in 2016. The Millennium Bulk Terminals case has been a poster child for groups looking to rein in states' certification because Washington blocked the permit not only on water quality grounds but also cited reasons related to increased boat traffic, climate change and air pollution. EPA began reviewing existing agency guidance on state certifications months ago, and Administrator Andrew Wheeler indicated yesterday the agency will forge ahead with that effort, while consulting with states and tribes. "Many states implement Section 401 of the Clean Water Act faithfully, however, on occasion, inconsistent implementation and outdated guidance and regulations have caused delays in infrastructure projects with significant national benefits," Wheeler said in a statement. Beneficiaries of the executive orders were quick to herald the actions yesterday. Chris Stockton, a spokesman for Constitution pipeline developer Williams Cos., said the company "supports efforts to foster coordination, predictability and transparency in federal environmental review and permitting processes for energy infrastructure projects." "These projects are essential to our economy, creating jobs and fueling growth by ensuring that clean, safe and affordable natural gas is readily available for families, power generation, businesses and manufacturers," he said. But Gov. Cuomo called the executive order a "gross overreach" and said other Trump administration rollbacks of environmental regulations only underscored the importance of the role of states in the Clean Water Act. "Especially at a time when the federal government has abdicated its responsibility to protect our environment and public health, states like New York are on the front lines protecting our clean water and the public health," he said in a statement. Other state leaders, some of whom usually agree with streamlining regulations, are also worried about how the orders will affect states' rights. The Western Governors' Association said in a statement that it has "concerns" about the order's impact. Spokesman Joe Rassenfoss noted in an email that WGA members and other associations of state officials "have repeatedly expressed to this administration and Congress that any legislative or regulatory changes to Section 401 water quality certification program must preserve states' vital authority under a system of cooperative federalism." He said the group is looking forward to "substantive, meaningful consultation with federal partners" about any rulemaking efforts. The order calls on the Transportation Department's Pipeline and Hazardous Materials Safety Administration to rewrite the safety rules governing LNG, which it notes were developed nearly 40 years ago primarily to address small facilities for seasonal natural gas storage. Since then, companies have built first LNG import terminals and then, when domestic gas reserves were unlocked through hydraulic fracturing, LNG export terminals. Trump gave DOT 13 months to finalize an "update" of the regulations, stipulating that it use "risk-based standards" as much as practical. Fred Hutchison, the president and CEO of industry group LNG Allies, said modernizing the regulations is most important to companies that have already put new LNG export terminals into operation or are in the midst of building them. They would like to see operational rules similar to those used in other countries. "PHMSA has been, on its own, trying to initiate such an approach but they have a small LNG-related staff and this, I think, heightens the priority for the agency to move forward with a rulemaking that the industry has been working with them to initiate for a while," Hutchison said. "It's a good thing to do, and we're glad the administration has decided to get on with it," he added. But most of the companies he represents are at earlier stages of LNG project development and place a higher priority for federal action on the promotion of trade in U.S. LNG and ensuring that projects can move through the broader federal review process with the Federal Energy Regulatory Commission, he said. Another element of the order would address LNG transport by rail car, for which regulations do not currently exist. The Association of American Railroads has pushed for new rules that could allow more domestically produced LNG to meet demand in markets like New England, where pipeline capacity can run short during demand spikes. Charlie Riedl, executive director at the Center for LNG, said updating the regulations within the timeframe should not be problematic since the industry has been discussing it with regulators. The part of the orders that caught observers most by surprise was on shareholder resolutions. A provision regarding energy project financing appears to target increasingly effective efforts by some investment funds to force publicly traded energy companies to address questions about climate change and other issues. The plan would require the federal agency that oversees funds subject to the Employee Retirement Income Security Act of 1974, better known as ERISA — which covers common types of retirement plans such as 401(k) and 403(b) plans — to look for "discernable trends" in their investments in the energy sector. It also calls for the Department of Labor, which oversees ERISA rules, to review its guidance on the fiduciary responsibilities associated with proxy voting. Danielle Fugere, president of shareholder advocacy group As You Sow, said that because ERISA-compliant funds are required to put their investors' interests first in deciding how to invest, the new guidance could have a chilling effect on their willingness to consider climate change among the factors they weigh. "I don't think there's anybody who invests solely" on environmental and social governance issues, Fugere said. "These are simply factors among many factors that a company might look at." "Climate change really is an important risk factor that the market is starting to take into account, as it should. And it's uncomfortable to companies," she added. Trump's energy orders also set up some juicy legal questions, experts said yesterday. The border-crossing order attempts to broaden authorities laid out in Trump's Keystone XL oil pipeline permit last month. Trump revoked an earlier State Department approval — one that had been struck down by a federal court — and replaced it with a new presidential permit that may not be subject to National Environmental Policy Act review. That approach is now being tested in a fresh lawsuit in the U.S. District Court for the District of Montana (Energywire, April 8). "While this order could speed the issuance of a presidential permit, it does not impact the timing or issuance of the multitudes of state and federal permits and authorizations that are required to construct a major piece of cross-border infrastructure," said Fred Jauss, a partner at the law firm Dorsey & Whitney. Environmental groups, as well as some states and lawmakers, appear poised to oppose Trump's Clean Water Act order, but litigation won't begin until EPA implements the recommended changes. "They can't circumvent the Clean Water Act and its requirements," said Hana Vizcarra, an attorney at Harvard Law School's environment and energy program. "This is going to be a long process." Like the Trump administration's proposal last year to open up most federal waters to oil and gas development, the president's Clean Water Act order has the potential to draw heated bipartisan backlash from states. "This tramples the notion of federalism," said University of Richmond law professor Carl Tobias. "Republicans — at least some of them — purport to care about that. One of the most important compromises in the tension around the federal-state relationship has been to give some of that power back to the states. "This upends that understanding," he said. The changes outlined in Trump's order would require an act of Congress, said Jauss. "The executive order is designed to amplify pressure on state governments that are not providing certifications," he said. "Implementation of this order will undoubtedly end up in the courts." While Trump's orders could be considered a win for industry, their benefits are an agency action — and a judicial review — away, said David Quigley, an attorney for Akin Gump. The fact that the border-crossing order still requires some input from the secretary of state, even if ultimate authority rests in the president's hands, is concerning, he said. "You'll see arguments that the agency involvement may still trigger environmental review," Quigley said. "You'll be back in the same place." Reporters Kelsey Brugger, Ariel Wittenberg, Jenny Mandel and Pamela King contributed.